It's Valentine's Day and 1 degree Fahrenheit out there in New York! Are you cuddling up with a special someone over a cup of hot chocolate by the fire? Let me share with you my favorite way to get cozy - a perfect cup of matcha latte with frothed almond milk. This high-end green tea is becoming the kale of all drinks because it's packed with chlorophyll, antioxidants and fiber. It boosts metabolism and helps burn calories. It detoxifies, calms the mind and relaxes the body, enhances mood and aids in concentration. For more benefits of matcha, click here or here. But I fell in love because it has everything I've ever wanted in a hot winter beverage - a slightly caffeinated drink with the right amount of kick that totally works with warm frothed milk. More and more cafes such as Fika and MatchbarNYC are serving this drink now as a healthier alternative to coffee. To make my own, I ordered a matcha starter kit from Matchabar that consists of a 30g Tin of ceremonial grade matcha, an Aerolatte Electronic Whisk and a bamboo spoon. You can also order from Amazon. Here's how I like it: 1/2 tsp of matcha stirred in with 1/3 cup of hot water, topped with frothed home made almond milk and a few drops of honey. What do you think of that as a real Valentine's Day treat? If you are not of Russian or East European descent, you probably won't be eating buckwheat groats as intact kernels on a regular basis. I usually rotate quinoa, millet, brown and purple rice as my favorite whole grain options. Although I love the taste of buckwheat flour-based pancakes and soba noodles, buckwheat groats are mostly forgotten and tucked away in my kitchen pantry. A few weeks ago, my dear friend Sveta from the Ukraine came to visit. She taught me two ways to cook this gluten-free, super nutritious whole grain! Like quinoa, it cooks very quickly. What you see in the picture is kasha, or toasted buckwheat. You can have it with any salads, savory dishes or as an alternative to oatmeal as a breakfast porridge. Rinse 1 cup of buckwheat and drain well. Put 3 cups of water in a saucepan and bring it to boil. Put buckwheat in a saucepan, with 1 1/2 cups of cold water and a pinch of salt, then bring it to boil. Turn off heat. Cover and let it sit for 30 minutes. 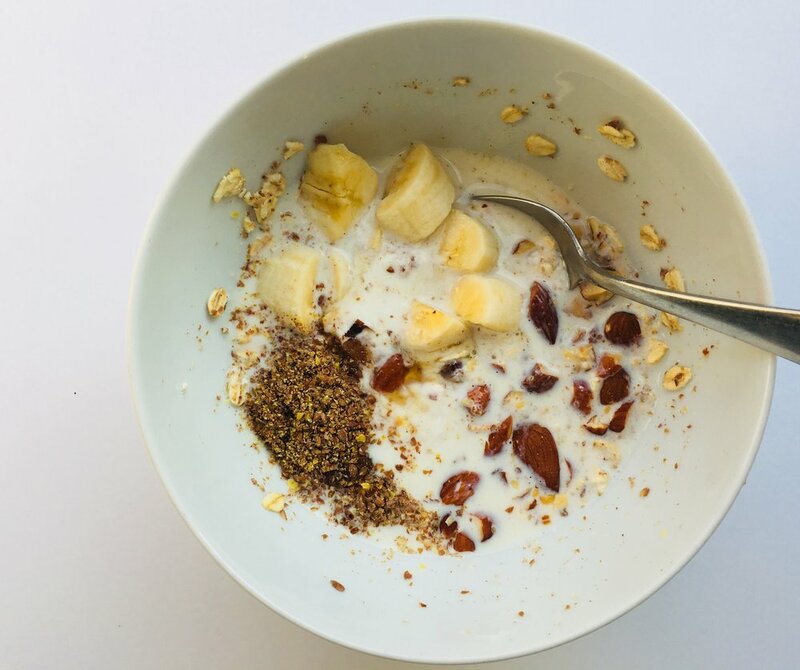 You can make porridge from any breakfast grain. Lately I have been obsessing with millet porridge. It is more neutral than quinoa and breaks up the monotony of daily oatmeal. In a large saucepan, toast 1 cup of millet over medium heat for 4-5 minutes or until they turn into a rich golden brown and become fragrant. Add 2 cups of water and a pinch of salt. Stir. Increase heat to high and bring water to a boil. Reduce heat to low and let it simmer for 15-20 minutes. Remove from heat. Let it sit covered for a few minutes. Fluff and serve. Save leftovers for morning millet porridge. In a saucepan combine 1 cup of cooked millet, 1 chopped banana, 1 cup of almond milk or water. Bring it to boil and turn the heat to low. Add a pinch of cinnamon. Allow it to simmer for 5-10 minutes. Stir frequently. When done, top with a few slices of apple or pear, a sprinkle of coconut flakes and your favorite chopped nuts and seeds. Looking for the best rush-out-the-door summer breakfast? Try these make ahead oatmeal jars. As a fan of batch cooking, I assemble a few at a time so during the hectic moments in the morning, all you need to do is to open the fridge door and grab a jar. You can even eat it while you are dressing, on your way to work or when you are settled at your desk. Leftovers make a good afternoon snack! A lot of my recipes are really formulas that you can customize to your liking. This is how it goes. Choose an unsweetened, plain yogurt, coconut yogurt, cow or goat milk kefir. My favorite brands these days are Anita's Coconut Yogurt, Green Valley Organics lactose free kefir and Redwood Hill Farm goat milk kefir. I want to emphasize PLAIN and UNSWEETENED because most yogurt products out there contain 15-30 grams of sugar easily per 8 oz. serving. Mix together 6 oz. of yogurt / kefir of your choice with 1/3 cup of rolled oats and 1 tsp. of chia seeds. Kefir tends to be runny but if you are using a yogurt that is too thick, add a little nut milk to create your desired consistency. Taste the mixture for sweetness. Add a handful of shredded coconut and / or 1/2 tsp. of maple syrup / honey if necessary. Put half the yogurt / oats mixture into the jar. Layer with mixed berries and chopped nuts. Repeat 1 more time. Close the jar and refrigerate overnight or up to 3 or 4 nights. Mix well and enjoy a no fuss breakfast the next morning! They were meant to be "cashew cookies", but my friend thought of a better name for them - a casual nibble with zero guilt, because they are gluten free, flour free and with no added sugar whatsoever. Eat them for breakfast, snack or dessert. They really are yummy, seriously! Step 1: Preheat oven to 350 degrees F. Line two cookie sheets with parchment paper. Step 2: Grind cashews in food processor with some small chunks remaining. Step 3: Transfer to a bowl and mix in shredded coconut. Step 4: Combine bananas, egg, vanilla extract, cinnamon, salt in a food processor and blend to create a thick, brown paste. Step 5: Pour the paste over the cashew-coconut mixture. Mix well. Step 6: Add almond milk to add more moisture to the mix. Step 7: Scoop 1 Tbsp of mixture at a time to cookie sheet. Flatten them and make sure they are not too thick. You should have about two dozen cookies. Step 8: Bake for 30 minutes or until golden brown. Let them cool completely and store them in the fridge. Before you throw in that protein power, think nuts and seeds! You get a rich protein shake with all the good fats and oils, without any processed ingredients. Don't be intimidated by the multitude of ingredients I use in this healthy morning smoothie. If you pre-wash the greens in bulk, have all the seeds lined up in mason jars at the right place, you can create a liquid breakfast that contains a microcosm of nutrients in less than 5 minutes. 4 green veggies - kale (3 stalks), spinach (a handful), cucumber (1/3), celery (1 stalk). Avocado (1/3) and banana (1/2) - two essential ingredients that iron out the fibrous texture of the greens and make the smoothie "smooth". 4 super add-ons - chia seeds, ground flax seeds, raw pumpkin seeds, maca powder. Unsweetened coconut water (or water). Small spoonful of honey for sweetness. A super food smoothie, or is it a dessert? This a an adaptation of raw foodist David Wolfe's super food smoothie. I adapted and shaved off about 10 ingredients out of the 16+ from the original recipe, including a bunch of Andean herbs and Chinese medicinal tonics. I guess the result is a less super food smoothie but still jam-packed with nutrients and anti-oxidants that is filling enough to be a meal, yet tastes unbelievably like a dessert, especially if you are a chocolate fan! A good blender. I don't have a Vitamix, but meet this little guy - Nutribullet. 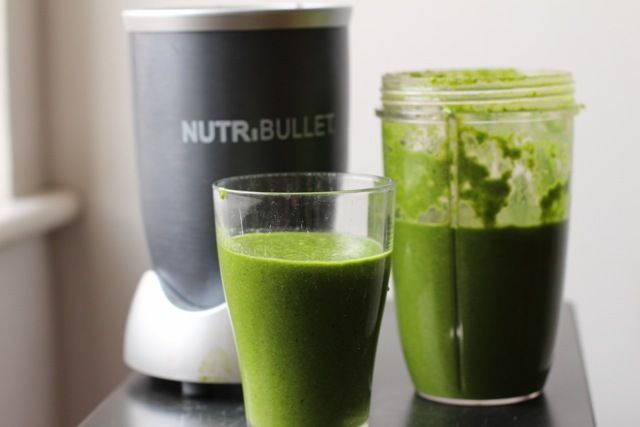 It is an excellent alternative if you don't want to spend over $100 for a blender. I used it to make almond milk this morning and it was fabulous! A base liquid. I am using the almond milk I just I made. You don't have to do this! Wolfe suggests water, coconut water, any nut milk or tea concoction you prefer. Add chocolate and berries. According to Wolfe, cacao is the number 1 anti-oxidant. Cacao and berries together is like the marriage of a power couple whose union multiplies the anti-oxidizing, anti-inflammatory superpower of each other. I am using raw cacao powder, a mix of frozen berries and unwanted strawberry stems from my daughter's breakfast. I recently discovered the Chinese berries I grew up with, my mom gives me bags and bags of each time I go back to Hong Kong, are the Goji berries (fructus lycii) everyone raves about these days. So I am also throwing those in! A dash of coconut oil to add body and hold it all together. Almond butter is also a good binding agent. A half to a teaspoon of maca - a high altitude crop from the Andes that is often compared to the Chinese ginseng. It is supposed to be an adaptogen, a herb that increases the body's ability to adapt to stress and changing situations. It regulates endocrine health and gives you the energy boost that coffee does without the caffeine. You can also sprinkle it on cereals, as I was told by a native Peruvian. Add honey as a sweetener. Enjoy! Play with the proportion of the ingredients. Mine is not too thick, not too sweet, just the way I like it!